"You aren't exactly the sharpest crayon in the box are ya?" One could possibly argue that Snowboard Academy has three strong strikes against it—stars Haim, Varney, and Nielsen—before the first frame has even been revealed. The brighter side of this is that the film can really only get better as it goes along. Well, maybe not. I didn't think it was possible, but this film actually sets the ski film genre back several years. Chris (Haim) is the rebellious son of the owner of the Chantecler Ski Resort and a die-hard snowboarder. After convincing his father (Joe Flaherty) to open the resort to snowboarders in addition to the skiers, Chris is left with the position of instructing the new sport. Chris' brother Paul (Paul Hopkins) resents Chris for this, and devises a challenge between skiers and boarders in a "winner take the resort" competition. Add to the mix a crazy safety engineer/entertainer Rudy (Varney) and Chris' gold-digging stepmother Mimi (Nielsen) and you have a plot that teeters on the utterly ridiculous. To get the lone positive out of the way first, the snowboarding and skiing sequences are amazingly well done. The tricks and camera work belong in a better film where they are not wasted between unfunny jokes. The lone downside to this aspect of the film is that director John Shepphird seems to be reusing several of the same shots throughout the film. Since that is out of the way, lets move on to just how bad this film truly is. The largest fault lies with the cast, which features not a single redeeming quality. Varney seems to be lost here as he meanders from scene to scene whilst bumping into objects and generally making a fool out of himself. Haim and Nielsen stumble through their dialogue painfully, including Nielsen's Russian accent, which would make any self-respecting cartoon villain blush. When viewing a film aimed at a certain type of sport or hobby, I ask myself whether or not the enthusiasts of the sport in question would find the film generally enjoyable. In the case of Snowboard Academy, I can only imagine that boarders and skiers alike will look at this film with a sort of stunned silence and treat it as an abomination of the sport. Image Transfer Review: Presented in a 1.33:1 aspect ratio the transfer for Snowboard Academy shows several signs of poor quality, though on the whole the transfer comes away on the positive side. Colors are done nicely with no bleeding and black levels look fine, with only a small amount of grain evident. Sharpness and detail are hampered by a soft quality that is present throughout the film, while edge enhancement is noticeable on several occasions. Audio Transfer Review: The Dolby Surround track is largely dialogue centered with only a few instances where the left and right speakers as well as the surrounds come alive to show any activity. Dialogue is done nicely with no distortion or drop outs. 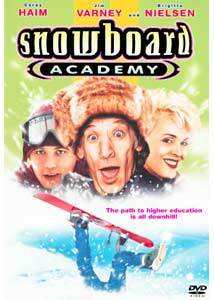 Extras Review: Trailers for Snowboard Academy and Daddy Day Care are offered. Snowboard Academy is a wasted exercise in both storytelling and filmmaking. Aside from some nice, but repetitive, shots of boarders and skiers in action there is nothing redeeming about this film. Stay far away.